← OSHA offers an APP to keep you safe in the heat! The part exists, sort of. The 2001 Dodge Caravan minivan with Automatic Temperature Control had poor rear A/C cooling performance and the technician decides (correctly) the issue is with the rear expansion valve. But it’s not like one with which he’s familiar. It has a solenoid on it (Figure 5). He tries to get a replacement, but the one the dealer has is not the same. It has no solenoid. But the dealer insists it’s the correct replacement and so he decides to try it. He just folds back and tapes over the wiring from the harness and installs the new expansion valve. The rear system works fine and the minivan is out the door. We occasionally see these “different” parts and if you’re wondering, “What gives?” we’ll talk about this one as an example. The solenoid comes with a two-wire pigtail, with one wire that was hot-wired into battery current at the rear blower motor relay on a fused output circuit, and the second wire was connected to the ATC control head, to a terminal that would provide the ground. 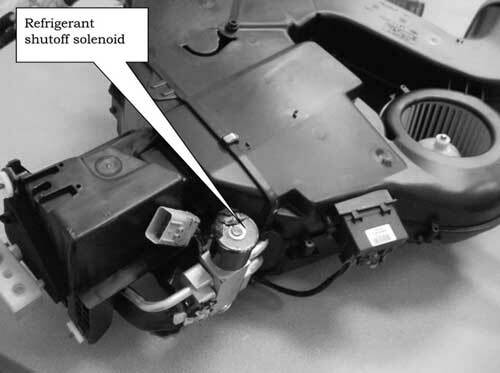 The ATC control head was supposed to be programmed so that with the rear A/C turned off, the solenoid would shut, blocking refrigerant flow to the rear evaporator. This would improve refrigerant circulation through the front system for better cooling performance. Sounds like a good idea, but later testing indicated that oil might be trapped in the rear system, affecting lubrication of the compressor and shortening its life. In any case, a lot of those solenoid-equipped expansion valves were installed, but the decision was made to cancel the project, and the control head was never reprogrammed to operate the solenoid. But Chrysler apparently had a supply contract for those solenoid-equipped valves, and so it used them in production. But without the reprogramming, they didn’t work. Is it possible that some early ones were programmed? Not that we heard, but it doesn’t really matter. Other upgrades to the system produced acceptable performance and if you ever see that valve on a 2001 model, at least you know the story. The solenoid was described in factory service information and supposedly was covered for diagnosis by the DRB III scan tool, but probably not. More often there are “phantom” systems that are covered in shop manuals that never get into production. We remember a two-stage front-end belt accessory drive for Mustang many years ago. It was intended to be a fuel economy enhancer, by reducing the power draw of the accessories. Ford fully developed it, and there it was, described in full detail in the shop manual. But it was expensive and therefore dropped from production before the first models rolled off the assembly line. This entry was posted in ACtion Magazine, Automotive training, Mobile Air Conditioning, Refrigerants and tagged #air conditioning, #Macs worldwide, #MACSW, #Mobile Air Conditioning Society, air conditioning components, auto air conditioning. Bookmark the permalink.